“Life is park!” proclaims Brutus magazine. The English isn’t good but the sentiment is. A veritable parkland is Japan. Wikipedia lists 34 national and 56 quasi-national parks. With these Brutus is not concerned. It celebrates the less imposing municipal park, which may be as spacious as Tokyo’s Yoyogi Park (541,000 square meters), or no larger than your backyard. Is size everything? It’s nothing. Quality is all, and what’s quality? Where one person sees flowers, another sees weeds. One person’s birdsong is another’s noise. There are parks you can spend an entire day in, walking, cycling, jogging, hardly aware that you’re covering the same ground over and over. Flush with excitement at discovering the sheer beauty of nothing in particular, you bring a friend next time, who sees … nothing in particular. It’s chilling, but that’s life. A park is where you find what you’re looking for, often before you know you’re looking for it: a flower, a shrub, peace, quiet, inspiration, company, solitude, gateball, baseball, sun, shade, talk, silence, a tree that invites you to lunch beneath its leafy branches. There are forest-like parks in which, five minutes into your walk, you forget you’re smack in the middle of a big city and a tumultuous century; 10 minutes into it, you’re lost; 15, you don’t care; 20, all sense of time has vanished. Nopporo Shinrin Park in Sapporo is like that. 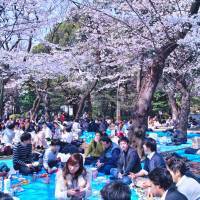 Yoyogi Park is not. To Yoyogi Park you can come, as Brutus puts it, “empty-handed.” Food and drink outlets, increasingly cafe-like as park development proceeds, abound. At Nopporo Shinrin Park there’s nothing except what you have in your backpack. It’s for people who take their escaping seriously. The public park is a late addition to urban culture. The Japanese love for trees and flowers is ancient and deep. Its first by-product was poetry; its second, gardening. From the ninth century on, gardens of exquisite loveliness adorned temples and noble estates. Temple gardens were tangible prayers, noble gardens tangible poems. Music, drinking, poetry recitals, love-making, entertainment of all kinds went on in them. Some survive to this day. They arouse our admiration and raise a question: Where did the common people disport? Certainly not there. 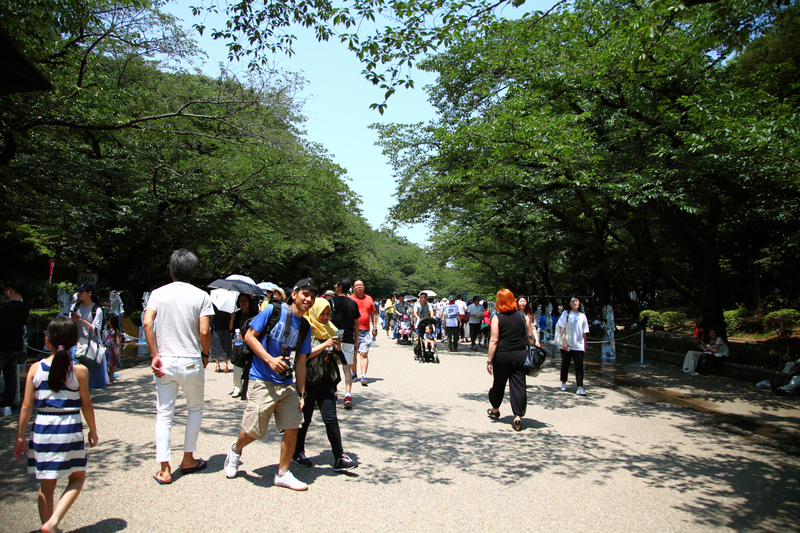 The first public park was Tokyo’s Ueno Park. It opened in 1873. Come one, come all. The concept was foreign, Western — as was so much that was happening in Japan then, 20 years after the country was “opened” by the American navy’s “black ships” and five years into the westernizing Meiji Restoration that followed. Almost as famous as Ueno Park’s cherry blossoms is its statue of that hulking, towering, most anomalous of heroes, Saigo Takamori (1828-77) — who died fighting the very Restoration he had done so much to bring about. He changed his mind, or rather his heart. Westernization was morally vile. The corruption of Meiji leaders who embraced it, he said, proved his point. His revolt was crushed but sincerity redeems all — at least his was held to. Hence the statue, and the respect bordering on reverence he inspires to this day. 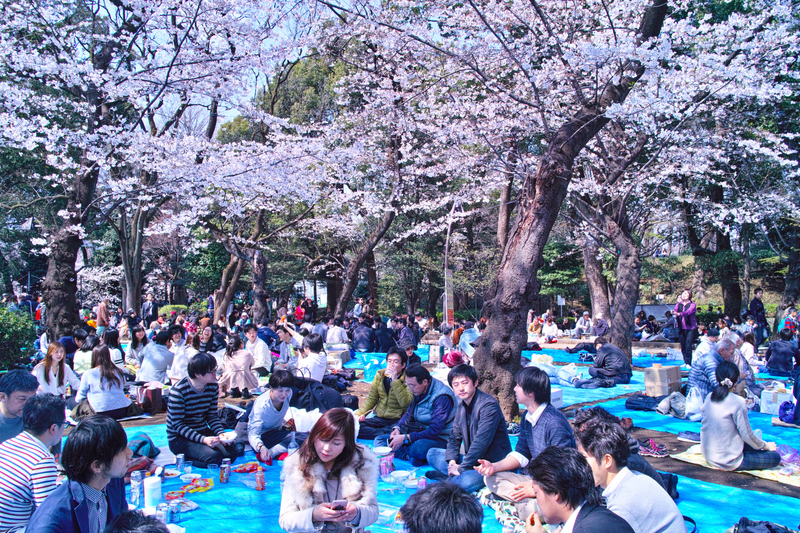 Hibiya Park, considered even more Western than Ueno Park, opened in 1903, and in 1905 became the backdrop for another Western import — the mass protest, modern Japan’s first. It was nationalist rather than what later generations would call progressive. Saigo would have been pleased. Japan had won the Russo-Japanese War. Why, then, were the spoils so meager? Why had the government not held out for reparations and more territory? Because the military was exhausted and the treasury drained — but the people didn’t know that (the government didn’t dream of telling them) and were incensed. Fired with patriotic ardor, they massed at Hibiya Park; the ensuing riots wreaked havoc to the point of bringing down the government. Few parks make history, and none are meant to. 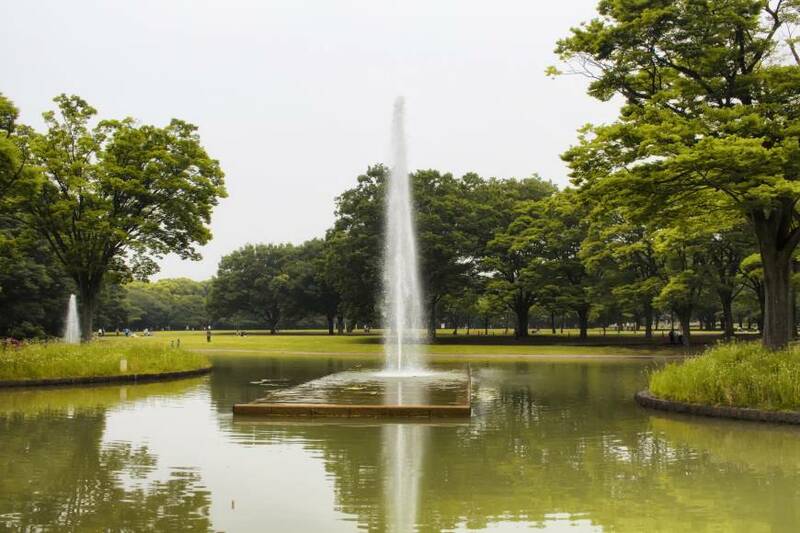 After the Great Kanto Earthquake of 1923, writes architect and historian Terunobu Fujimori in Brutus, neighborhood parks sprang up — modest affairs, most of them, many adjoining schools that were also being built en masse. Tokyo overflowed with children; the whole nation did. It’s hard to imagine now. Playtime, kids! Off to the park with you! Did they know how lucky they were? Earlier generations of children had had to do without parks. Actress Sadako Sawamura (1908-96) recalled playing in the alley, circa 1918, in her memoir, “My Asakusa” (1977): “Because every house was cramped, parents encouraged their children to play outdoors. Fortunately (there were) many vacant areas” — temple grounds, “the tea field in front of the local flower garden” and so on. Narrow streets and “irregularly shaped lanes” were “perfect for hide-and-seek.” Kids sang, played, fought, made up, made toys out of whatever was lying around, and all in all seem livelier than their remote descendants today, who — as the Asahi Shimbun noted in a discussion of the issue earlier this month — are given smartphones before they’re a year old, the better to equip them for the digital life ahead. The unpretentious little parks Fujimori mentions are today more likely than not to be deserted as you pass by — partly because there are so few kids, partly because swings, slides, sandboxes and jungle gyms lose out to more sophisticated amusements and increasingly demanding school work. Children are virtually absent from Brutus’ package — but not quite: The toddlers it photographs in Yoyogi Park are with one of several neighborhood day care centers that have a special arrangement with the park, an innovation that is gaining ground as one possible solution to the shortage of supervisable play space. But why, why, sighs columnist Asato Izumi of his favorite park, are they forever cutting the grass? Grass needs cutting, no one denies it, but the industrial strength, unmuffled motorized blades commonly in use — have those who wield them grown deaf to its racket? Or merely to its denaturing, despoiling implications?